Step 1: Slice each pear in half lengthwise, preserving the stem, if possible. Core the pear halves using a melon baller or small spoon. Rub the cut sides with the lemon to prevent browning. Squeeze a few drops of lemon juice into each cavity. Step 2: Beat the butter and brown sugar in a mixing bowl with a wooden spoon. Beat in the graham cracker crumbs, lemon zest, spices, rum, and vanilla. Spoon the mixture into the pear cavities. Step 3: Set up the grill for indirect grilling and preheat to medium. If using a gas grill, place the wood chips in the smoker box or in a smoker pouch and preheat on high until you see smoke, then reduce the heat to medium. 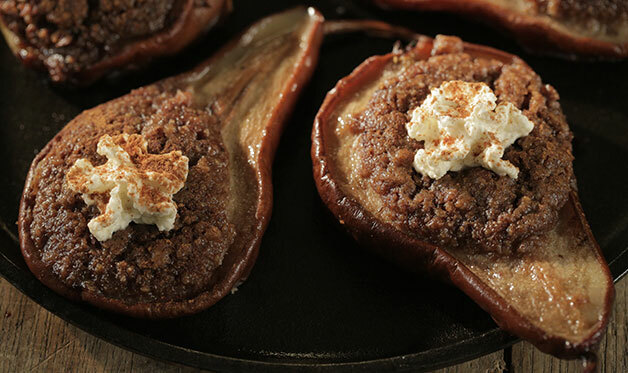 Step 4: Arrange the filled pear halves in a single layer in the prepared aluminum foil pan. Place the pan in the center of the hot grate away from the heat. If using a charcoal grill, toss the wood chips on the coals. Cover the grill and smoke-roast the pears until nicely browned and soft on the sides, 40 minutes to 1 hour. Step 5: Transfer the pears to a fireproof platter. Gently warm the Poire Williams in a saucepan but do not let it boil. (It should be body temperature warm.) Touch a match to it to set it on fire, then pour the flaming brandy over the pears.